Are you interested in web design or expanding your web presence? Have you ever thought about creating your own website or blog but didn’t know where to start? If this sounds like you, or you just want to come learn about an exciting opportunity available to all Oxy students, then consider coming to the first OxyCreates workshop on Wednesday April 5th, in the Brown Lab. 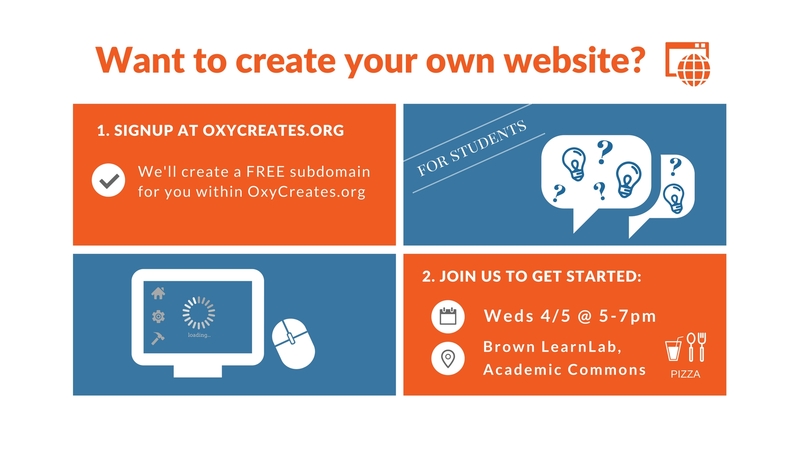 Oxycreates is a free program available to all students that allows you to host your own web content on the Occidental servers. The workshop will cover how to log on, go through the basic components of the program, show student examples, and provide guidance on building a simple site. All are welcome but space is limited, so please visit https://oxycreates.org and click the “request access” tab to reserve a spot. We hope to see you there!